And so, it isn’t that surprising that after a month in our new home, this little guy has turned up on our doorstep. Literally, he’s scaling the ‘cat-proofed’ fence and has taken up residency on our front door step. He’s missing a few teeth, has fleas, is missing patches of fur, has congealed blood on his face and is a skinny little thing. He’s got bite marks on him but I’m not sure if they are from fighting or just from himself as he’s always biting where the fleas make him itch. He’s smaller than Cat and she is tiny. He makes her look overweight! Speaking of Cat, she is the main reason that I’m not already off to the vets and welcoming this one into our home. I’m not planning on adopting a second cat but if this one is choosing to camp outside our house then we’re going to have to go and get him cleaned up unless we lock Cat indoors. An email has been sent to a local animal shelter to see what we can do about getting him sorted out. 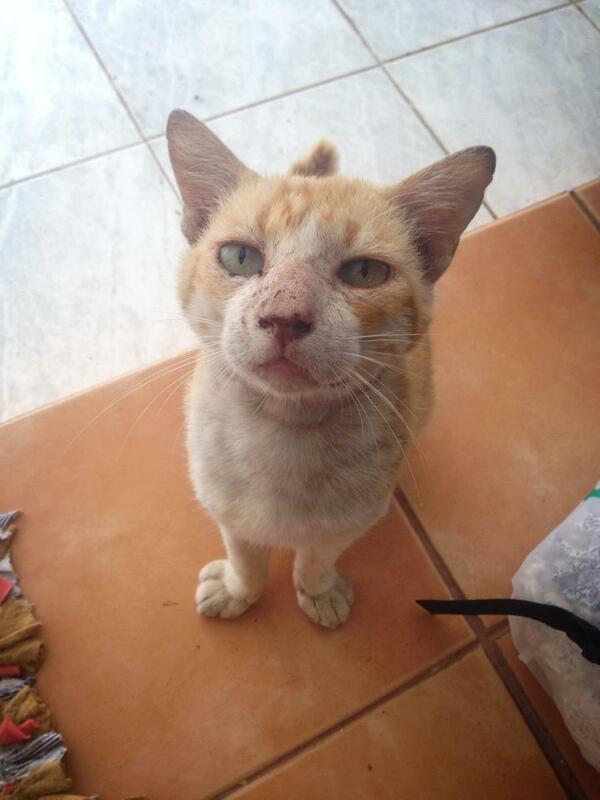 He probably needs some anti-parasite stuff, needs his skin treated and while we’re at it I’m keen to get him neutered to do our bit towards stemming the ever-growing population of street animals on this island. Also, once neutered, he’s less likely to get into street fights and therefore less likely to get injured. Once he’s all cleaned up I’ve got no problem with feeding him and giving him some shelter in our front garden, especially with the rainy season around the corner. I just have to try really hard not to totally take him in. He’s about a year old and has spent that year living on the streets so hopefully he will be content with living outside our house. It’s bad enough having the thought that I have one cat to re-home/take back to the UK with me eventually. Posted on April 9, 2014 October 11, 2014 by cornishkyliePosted in Day to day life, Expat life, Random thoughts, TravelTagged animal rescue, animals, phuket, stray cat, street animals, TEFL, Thailand. Glad to hear that you are taking such a responsible approach. Both cats are lucky to have found you. Thanks. I get the feeling that some people think I just want lots of pets but I just can’t let an animal suffer and I think they all deserve a basic level of health and opportunity. If I have to pay out a few hundred bath so be it. He adopted us anyway! If there is a Buddhist temple in your area, the monks will usually take care of stray animals (all life is sacred, you know), so they might be able to take care of this cat. We’ve adopted dogs from the temples before. Cats are also valuable in villages where there are plenty of rats for them to hunt. The cats and dogs are usually rescued from the temples around here as they can’t care for them – too many people dump their animals there already! Have you seen the cats with short tails? We saw dozens and dozens on Phi Phi Island. I always wondered if it was a stylistic/fashion reason that people cut off the cats’ tails or that there were just many unfortunate cats on the island.